The material clutter of contemporary living is mainly due to the rise of consumerism in the 20th century. It lead many people in the world over to question this way of life and opt for a more simple means of living. This could mean letting go of excess and pursuing goals based on moral and ethical as opposed to monetary or material considerations. Simplicity as a spiritual practice, however, has long been practiced and is present in the doctrines of most religions. In the Christian religion believers observe lent, a period in which they release themselves from cherished possessions. This is done in order to strengthen their faith. 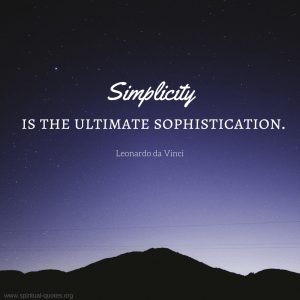 Judaism identifies seven values of spiritual simplicity. These are: humility, gratitude, avoiding waste, preserving nature, not wasting time, justice, and repairing the world. One of the most important aspects of voluntary spiritual simplicity as outlined in the teachings of Gandhi is that it is an inner- as well as an outer- condition. It involves more than simply the shedding of material excess and the surrendering of yourself to a higher power. On the other side, it revolves around a singleness of purpose and the avoidance of anything that is not necessary to achieve this purpose. Our lives are disarranged with material excess and clutter because this is what we value. In order to observe voluntary spiritual simplicity it therefore necessary to shift what we value most away from material gains and towards the pursuit of spiritual enlightenment. Making this shift in principles is what ultimately gives birth to your sense of purpose and will enable you to rid yourself of the unnecessary purpose. Not because you feel that this is something that you want to do, but this is what is required of you to reach your full potential as a human being.